Selecting between a servo motor and a stepper motor can be quite a challenge involving the balancing of several design factors. Cost considerations, torque, speed, acceleration, and drive circuitry all play a role in selecting the best motor for your application. Stepper and servo motors differ in two key ways, in their basic construction and how they are controlled. Stepper motors have a large number of poles, magnetic pairs of north and south poles generated either by a permanent magnet or an electric current, typically 50 to 100 poles. In comparison, servo motors have very few poles, often 4 to 12 in total. Each pole offers a natural stopping point for the motor shaft. The greater number of poles allows a stepper motor to move accurately and precisely between each pole and allows a stepper to be operated without any position feedback for many applications. Servo motors often require a position encoder to keep track of the position of the motor shaft, especially if precise movements are required. Driving a stepper motor to a precise position is much simpler than driving a servo motor. With a stepper motor, a single drive pulse will move the motor shaft one step, from one pole to the next. Since the step size of a given motor is fixed at a certain amount of rotation, moving to a precise position is simply a matter of sending the right number of pulses. In contrast servo motors read the difference between the current encoder position and the position they were commanded to and just the current required to move to the correct position. With today's digital electronics, stepper motors are much easier to control than servo motors. Stepper motors offer several advantages over servo motors beyond the larger number of poles and easier drive control. The design of the stepper motor provides a constant holding torque without the need for the motor to be powered. The torque of a stepper motor at low speeds is greater than a servo motor of the same size. One of the biggest advantages of stepper motors is their relatively low cost and availability. For applications where high speed and high torque is needed, servo motors shine. Stepper motors peak around speeds of 2,000 RPM, while servo motors are available many times faster. Servo motors also maintain their torque rating at high speed, up to 90% of the rated torque is available from a servo at high speed. Servo motors are also more efficient than stepper motors with efficiencies between 80-90%. A servo motor can supply roughly twice their rated torque for short periods, providing a well of capacity to draw from when needed. In addition, servo motors are quiet, available in AC and DC drive, and do not vibrate or suffer from resonance issues. For all of their advantages, stepper motors have a few limitations which can cause significant implementation and operation issues depending on your application. Stepper motors do not have any reserve power. In fact, stepper motors lose a significant amount of their torque as they approach their maximum driver speed. A loss of 80% of the rated torque at 90% of the maximum speed is typical. Stepper motors are also not as good as servo motors in accelerating a load. Attempting to accelerate a load too fast where the stepper cannot generate enough torque to move to the next step before the next drive pulse will result in a skipped step and a loss in position. If positional accuracy is essential, either the load on the motor must never exceed its torque or the stepper must be combined with a position encoder to ensure positional accuracy. 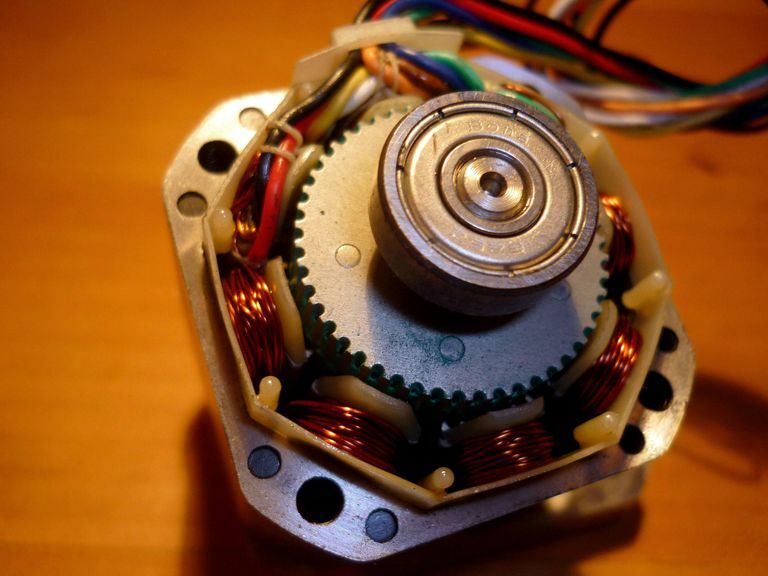 Stepper motors also suffer from vibration and resonance problems. At certain speeds, partially depending on the load dynamics, a stepper motor may enter resonance and be unable to drive the load. This results in skipped steps, stalled motors, excessive vibration, and noise. Servo motors are capable of delivering more power than stepper motors but do require much more complex drive circuitry and positional feedback for accurate positioning. Servo motors are also much more expensive than stepper motors and are often harder to find. Servo motors often require gearboxes, especially for lower speed operation. The requirement for a gearbox and position encoder make servo motor designs more mechanically complex and increase the maintenance requirements for the system. To top it all off, servo motors are more expensive than stepper motors before adding on the cost of a position encoder. Selecting the best motor for your application depends on a few key design criteria for your system including cost, positional accuracy requirements, torque requirements, drive power availability, and acceleration requirements. Overall, servo motors are best for high speed, high torque applications while stepper motors are better suited for lower acceleration, high holding torque applications.